Some of my best landscape design inspirations come from simply walking around in the world. It's also a fantastic education, and you can't beat the price. Here are a few of the lessons I've learned this year — for worse and for better. Handle your water. Water in the landscape can be a wonderful element to either enliven or calm a space. Unfortunately, from poorly designed irrigation that applies more water to the pavement than the lawn, to poorly conceived drainage that creates safety hazards, there's no shortage of examples of ways we all can handle our water better. My "Worst of the Wettest" award goes to the fountain at an outdoor shopping center in San Mateo. The open, parklike setting is so sunny, so warm, so lush, so… so stupid to create a ramp right up to the water's sparkling edge, then post a "No Water Contact Allowed" sign. Make the right cut. When you put plants in a landscape you're entering into a bit of a contract. They'll provide shade and process carbon dioxide, and you'll give them food, water and a bit of tender loving care every now and then. Unfortunately, too many gardeners — homeowners and municipal landscapers alike — forget the "tender loving care" part, and we wind up with pruning abominations like these. My "Cruelest Cut" award goes to whomever decided California Gray Rush should be pruned into little hedgehogs every winter. (Hint: it's not actually a grass. Let it grow.) It's not fair to the plants, and it's not fair to those of us who have to look at them. Lead the way. An entire industry has evolved around "wayfinding" — the art of helping people navigate through complex environments, particularly in urban settings. Personally, I really enjoy when this can be achieved implicitly, with landmarks such as sculpture or variations in paving materials rather than explicit signs. Sometimes, though, signs simply are the best medium for communicating what lives where. But they're pretty useless if they're so tall, and the lettering so small, as to be unreadable. My "Losing Sight of the Destination" award goes to the City of Palo Alto, which installed such signs at major intersections along University and California avenues. Good thing no one goes there anymore. … vs. dropped from the sky. Rock out. Boulders in the landscape are timeless sentinels, a great way to define spaces and make any area feel more natural. They look their best when they seem to be emerging from the earth — I typically specify they be buried to about 1/3 of their height. And bigger is better, perhaps because it seems impossible that such mass could have been placed by man. I was thrilled to see these ginormous specimens going in at the Hewlett-Packard campus at 1501 Page Mill Road in Palo Alto. Too bad some of them didn't go in quite far enough. The groundcover plantings may yet grow up to hide the "taper" at the rocks' bases, so no awards here — yet. But I'm watching. Go into the light. Especially in the winter when the sun is low and weak, we have lots of opportunities to create stunning effects with plants that either reflect the light or refract it. Palo Alto has been putting in lots of Freeman maples lately, and their color is some of the most brilliant I've seen. Up in San Francisco, this set of Leucadendron from Flora Grubb Gardens positively glows in the late afternoons, as do the massings of Pennisetum and Muhlenbergia grasses at Solage resort in Calistoga. Awards all around for designing with a "light" touch. How to get air and water to these roots? Better still, cut in a lot! Put down roots. It's not new this year, but I think I'll give my best in show award to the repaved parking lot at Town and Country Village, which has held up extremely well for a few years now. The best part? The permeable "slots" cut into the asphalt, set with interlocking pavers whose gravel-filled gaps allow air and water to reach the roots of the heritage Valley Oak trees that give the property so much character. It's an incredibly simple, yet creative, solution that I haven't seen anywhere else. I'll be "root"ing for its success. When your eyes are open, it's remarkable how much you can learn from the big guys. Please let me know if you have any lessons to share. And thanks for giving me some of your time this year… here's to continuing our education in 2011! Just up the street from me lives the global headquarters of a little Internet startup named Facebook. The company moved into the former Hewlett-Packard digs at 1601 California last year, making some interesting architectural updates but not really touching the landscape. One of the defining features of the 8.5-acre site was a large Valley Oak (Quercus lobata), which unfortunately was surrounded by lawn for decades. It may look nice and clean, but oaks — even the riparian Valley Oak — and lawns simply aren't compatible. The lawn requires far too much water for the oak's liking, and all that shallow irrigation encourages fungus that stresses, weakens and eventually kills the oak. Well, Sunday a gust of wind brought the inevitable, and around 10:00 a.m. the tree blew over. The arborists were still hard at work removing the body some six hours later, and I came by just in time to get a good look at the trunk. I was struck by the amount of rot in the heartwood. That grayish block just right of center? Concrete. I haven't counted the rings yet, but the arborists and I guessed the tree was at least 80 years old. It's an ignominious end for such a stately specimen; but are we really surprised? Urban trees are subject to all sorts of ecological insults, from incompatible irrigation to soil compaction, pollution, and sheer human ignorance — the arborist pointed out where concrete had been used to fill a void in the trunk, probably 30 years ago (by the way, please never do this). There were no outward signs of trouble, and I'm really glad that the huge tree came down on a Sunday morning when the site was largely empty of people. But it is a cautionary tale: if you have a special tree on your property, care for it. Also, cherish it. 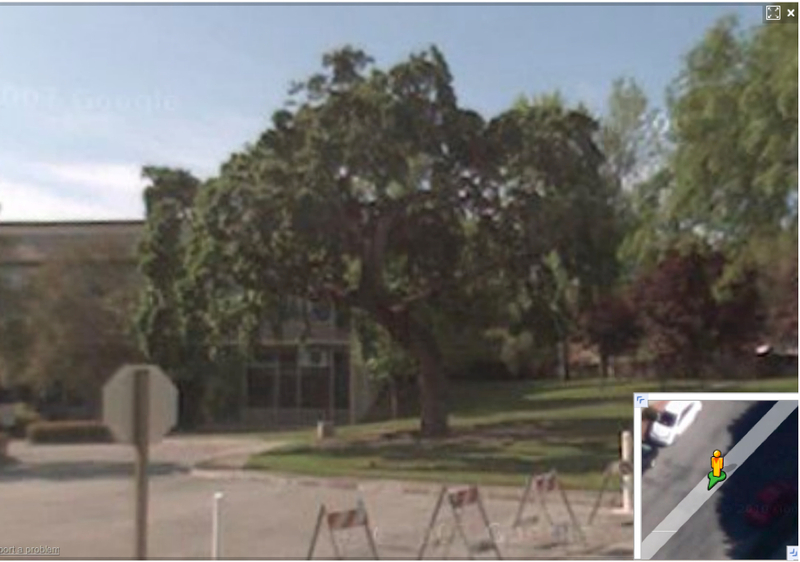 I don't know how much the Facebook folks appreciated this tree, but it would have been the perfect social hub if the social network had simply pulled out that lawn, put in a more compatible landscape, and added a few benches and tables. And finally, if you've got a specimen like this in your neighborhood, document it: I was surprised by how few photos I could find of this tree. (The first one above is from Google's "street view.") It's a reminder that nothing lasts forever, and some day we'll want to remember the tree that was.